Southeast Asia has come a long way. ASEAN has evolved from an agrarian backwater that has been stricken by war and ravaged by colonialism to become a global economic powerhouse. The 10 members that make up ASEAN now have a combined gross domestic product (GDP) of US$2.4 trillion, and is the third fastest growing major Asian economy after China and India. “Looking back, ASEAN helped transform Southeast Asia from an area of enmity into a region of amity; from a pocket of poverty into a land of opportunities, and; from a zone of instability into an ecosystem of peace, stability, and prosperity,” said Retno Marsudi, Foreign Minister of Indonesia succinctly of ASEAN’s transformation. While ASEAN as a bloc may still be behind some of the world’s major players such as the United States (US), China and the European Union (EU), the region is quickly catching up. ASEAN has embraced with open arms the Fourth Industrial Revolution by quickly establishing itself as a tech hub with a robust tech start-up scene. ASEAN is already home to a number of unicorns – start-ups valued at US$1 billion and above – such as Grab, Sea and Go-Jek. With the Fourth Industrial Revolution heralding new technology to the region, mixed feelings arise. On one hand, there is genuine excitement that these new technologies could make the lives of millions of people in the region easier. However, on the other hand, many observers fear that automation and Artificial Intelligence (AI) could cause eventually result in widespread unemployment. As ASEAN’s global impact increases so does its geopolitical importance and influence. Also due to the region’s strategic location on the map, Southeast Asia has received unprecedented attention from global powers, namely the US and China. Over the past five years, China has been making inroads in the region. The world’s second largest economy has been pouring in billions of dollars in investments for various infrastructure projects in virtually every ASEAN country. Furthermore, China is carving out its own territory in the waters of the South China Sea despite the ruling against them at the Permanent Court of Arbitration. Meanwhile, the US is looking to counter the influence of China by way of its allies in the Quad - Australia, Japan and India. ASEAN also faces a number of internal challenges too. At the moment, Myanmar is facing a humanitarian crisis with the Rohingya Muslims and democracy is fast eroding in other neighbouring countries such as Thailand and Cambodia. 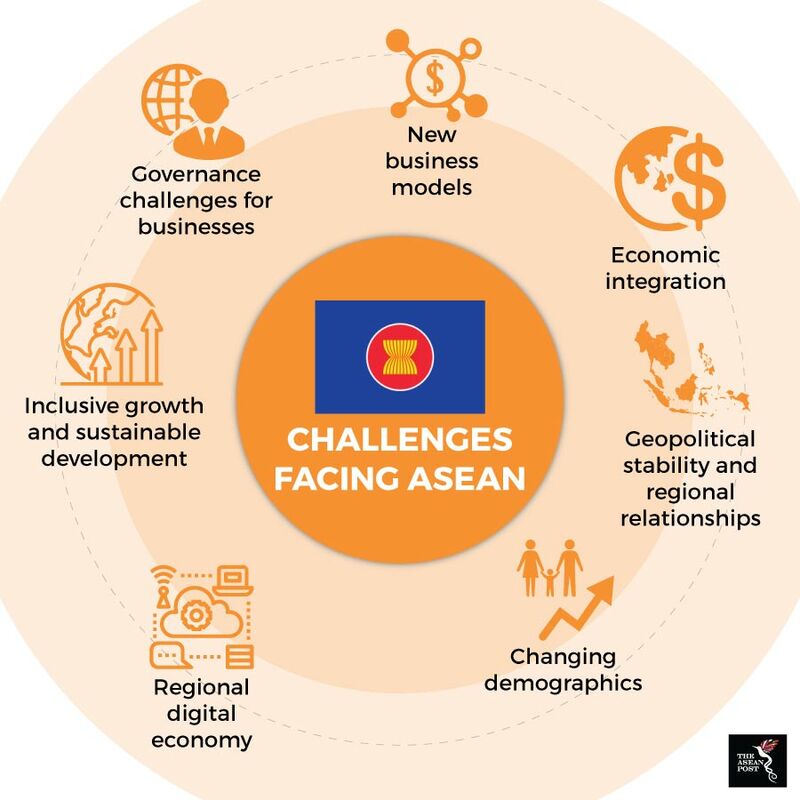 As the region fast forwards into the 21st century at lightning pace, important and difficult questions about the future of ASEAN are being raised. Will automation lead to mass unemployment? Can ASEAN become the next global hub for technology? What is the future of democracy in the region? This is where the World Economic Forum (WEF) hopes to make a difference. This Swiss non-profit foundation is best known for its annual summit in Davos where business leaders, politicians, academicians and just about anyone of global influence congregate to solve some of the world’s most complex problems. By bringing the summit to Southeast Asia, WEF on ASEAN looks to find answers to such difficult questions. Carrying the theme of “ASEAN 4.0: Entrepreneurship and the Fourth Industrial Revolution” WEF on ASEAN 2018 in Hanoi, Vietnam will be attended by 900 political, business, academic and civil society leaders. Notable heads of state that will be attending include Myanmar’s State Councillor Aung San Suu Kyi, Singapore Prime Minister Lee Hsien-Loong, Malaysia’s newly elected Prime Minister Dr Mahathir Mohamad, Indonesian President Joko Widodo, controversial Cambodian leader Hun Sen, the leader of Lao Thongloun Sisoulith and others. These heads of state will discuss their ideas and opinions in a discussion titled “ASEAN Priorities in the Age of the Fourth Industrial Revolution”. Other discussions lined up include Trade in Trouble: Navigating Geo-Economic Tensions and Asia’s Economic Outlook featuring Indonesia’s Minister of Finance Mulyani Indrawati and Santiprabhob Veerathai, Governor of the Bank of Thailand. Also slated to happen at the forum are special one on one sessions with Dr Mahathir Mohamad, Aung San Suu Kyi and Hu Chunhua, Vice-Premier of the People's Republic of China, respectively. The forum will also pay special attention to entrepreneurs and their role in shaping the future of the region with 80 Southeast Asian start-ups selected to participate. These start-ups come from across the region and represent a wide variety of sectors, from financial services, logistics and e-commerce to agriculture, media and healthcare. “We expect the start-ups to make an important contribution to shaping the debates at the meeting about the impact and course of new technologies and disruptive business models,” said Justin Head of Asia Pacific and Member of the Executive Committee at WEF.